The lecture will open with a short musical program. 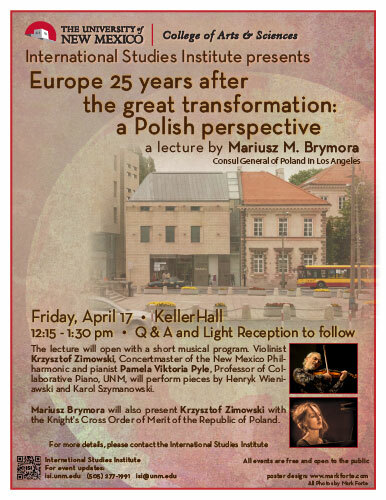 Violinist Krzysztof Zimowski, Concertmaster of the New Mexico Philharmonic and pianist Pamela Viktoria Pyle, Professor of Collaborative Piano, UNM, will perform pieces by Henryk Wieniawski and Karol Szymanowski. Mariusz Brymora will also present Krzysztof Zimowski with the Knight's Cross Order of Merit of the Republic of Poland.